The best way to preview a new logo or design as embroidery is to see an actual sewn example. If you closely compare your sew out sample to a garment from the completed production run, it’s likely you will find some variance. If the same digitized file is used for both the sew out and the production, how is this possible? An embroidery machine has a number of stations referred to as heads. The number of heads on a machine can range from 1 to twenty. An embroidery operator can sew as many garments as there are heads on the machine. In other words, if the embroidery machine has 10 heads, the operator can sew 10 caps at once. If the order is for 20 caps, the operator will hoop, load, and sew 10 caps first. After unloading the first 10 caps, the operator will hoop load and sew the remaining 10 caps. You with me so far? Let’s take this scenario one step further. If the machine has 10 heads and the order is for 5 caps, 5 of the heads will not be used in the production of the order. This is where the red flag comes up. In a production environment, such as embroidery manufacturing, efficiency is key in keeping costs down for customers. It doesn’t make sense to take up an entire embroidery machine to sew one sample while the additional heads on the machine are not in use. 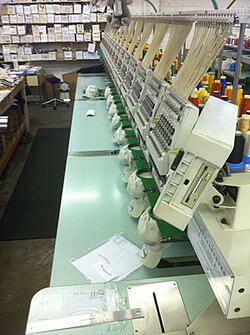 For this reason, embroidery houses designate a single head machine specifically for sewing samples. 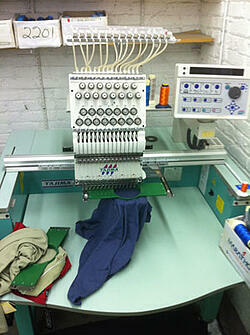 Below are pictures of a single head and multiple head embroidery machines. Once the sew out is approved and the job is set up for production on a multiple head machine there are a number of factors that will differ inevitably. Sewing needles are changed when they dull, but level of sharpness is bound to vary from machine to machine and even from head to head. The amount of tension from the thread spool to the needle can be slightly different from the sample machine to the production machine as well as the the stress level on the bobbin spool. These slight differences will affect the way the embroidery looks, but not much. Embroidery houses typically have rolls of standard fabrics that can be used for the sew out. The operator does their best to match the color and fabric type, but it’s not likely the exact fabric will be used for a sample. Different fabrics hold thread a little differently depending on the tightness of the weave and quality of the fabric thread. If you would like to see the logo or design sewn on the actual garment for your order, request a pre-production sample. You will approve a sew out first, then the actual sample will be sewn. Keep in mind, a pre-production sample will be sewn on the single head machine and not the machine that sews the full order. So with all of this variation, why approve a sew out when it does not represent the final product exactly? Because the variance is really not that great. Sew outs and embroidery are meant to be viewed at arms length. Both fabric and thread are soft, flexible materials. By nature the shape will not be tight and perfect. Imperfections detectable at arms length justifies a new sew out.